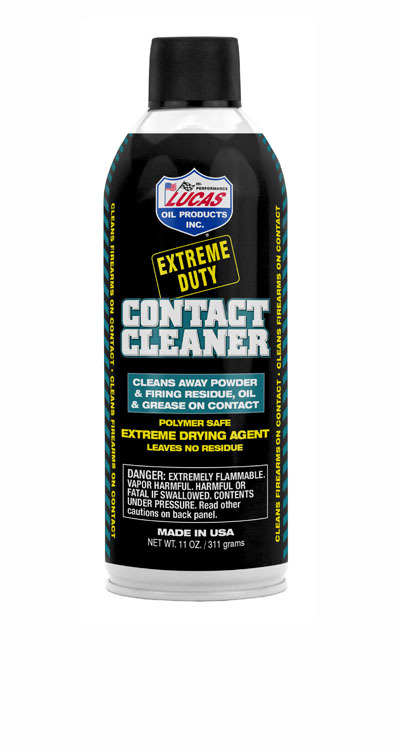 Used and recommended by gun manufacturers throughout the industry, Lucas Extreme Duty Contact Cleaner is a unique blend of solvents and cleaning agents designed to blast away powder residue, grease, oil and other debris from firearm actions slides, barrels and parts with its high pressure spray. Able to displace water, Lucas Extreme Duty Contact cleaner is quick drying and leaves zero residue, making it ideal for final degreasing prior to bluing, parkerizing, or spray finish applications. Safe on your firearm's metal finishes and will not harm polymers subjected to incidental contact. Made in the U.S.A. 11oz canister.